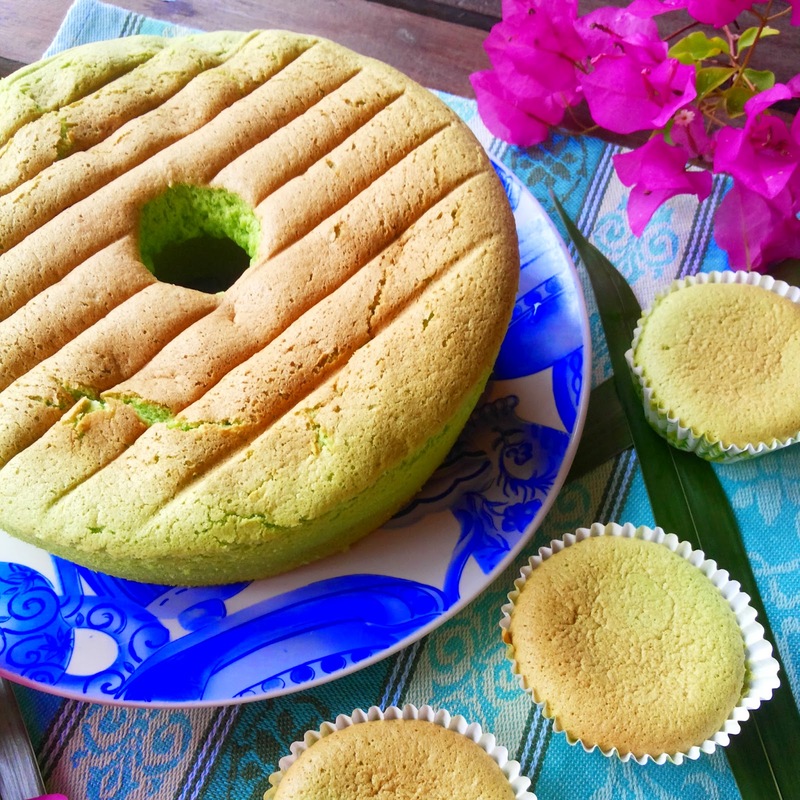 18.09.2014 - Nongsa, Batam I thought i wont be baking any chiffon cake for a longtime, but here i am doing it again, feels like ages didn't bake a good pandan chiffon cake and im like dying for one and searching for good pandan chiffon recipe to try out. 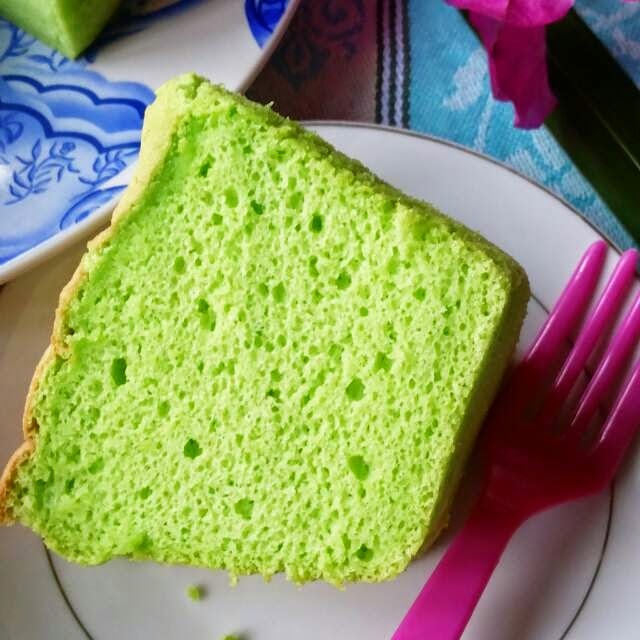 Searching high and low for a simple recipe and finally i was attracted to this Pandan Chiffon Cake from Aunty Yochana's Cake Delight blog. 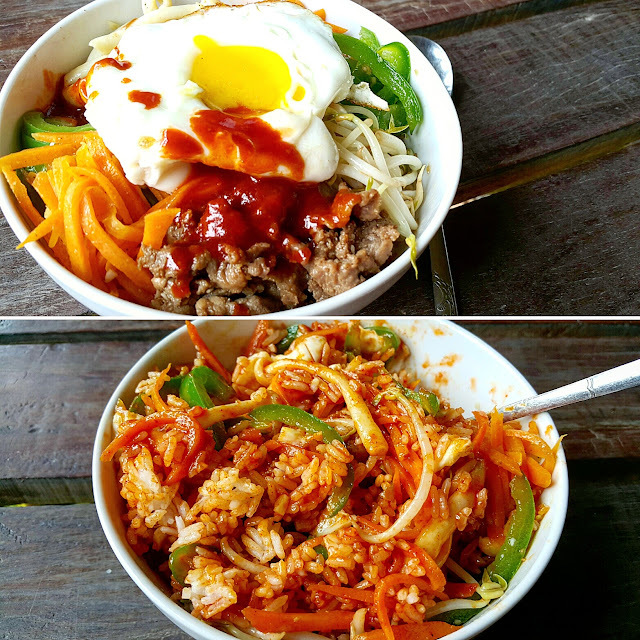 She has so many wonderful recipes on her blog, please do feel free to check her out!! 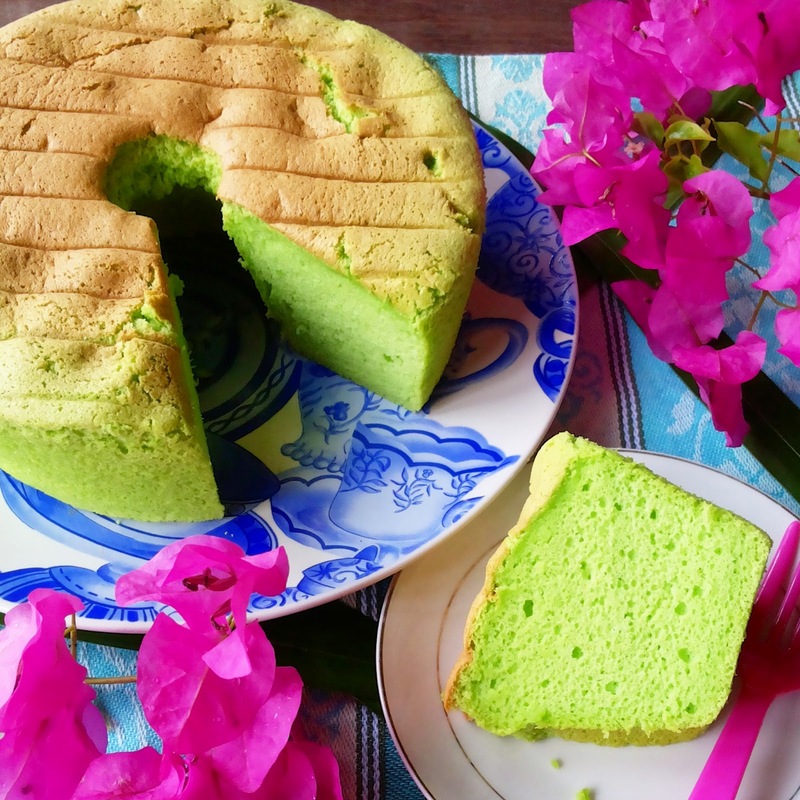 I have no regrets to pick her Pandan Chiffon Cake recipe because it turn out so perfectly good!! im so lucky to get the right recipe to bake for precious time of preparation and ingredients used...however, i did some adjustment on the sugar amount used, i only used 130g of sugar in total instead of 180g. im so glad i did the reduction of the sugar amount, with 130g sugar, the cake has a perfect sweetness, not overly sweet. It could be too sweet for me if i use 180g. Anyway, back to the result, my cake was turn out so perfectly good, the height was perfect and texture was soft, spongy, airy but the only thing is that i can't invert my cake after bake. As im trying to invert it upside down, the cake was eventually dropped out from the pan...lol..so i quickly safe the cake from the table and move it to the wire rack. lucky the cake still stay light and height wasn't affected with the cooling method i used like normal cake. By the way, i have this not a regular chiffon pan but has a tall and deep, but mine is very short and i managed to get another 4 cupcakes size chiffon. (2) Whisk egg white with cream of tartar and gradually pour in the sugar. Whisk at high speed until frothy and stiff peak forms. (4) Pour into a 9" (23 cm) tube pan. Bake at 170C for about 40 to 45 min.s or until cooked. I used 22cm tube pan, Preheat at 190c and bake at 180c for 55mins + extra 4 cupcakes, bake at lower rack. Another 12 mins before finish, i lower down temperature to 170c b cos the cake rise high with just 2 very small cracks. ( adjust your own oven to the right temperature ). (5) Remove from oven, invert cake onto cooling rack until completely cooled before removing from the pan. No need to invert upside down, the cake would drop, so just cool it on the rack. the cake is very delicious soft and not too much shrinkage. perfect and sorry to say it is better than Kitchen tigeress recipe. i will use this for future pandan cake or cupcake.